Celebrating it’s World Premiere at the 2018 Fantasia Film Festival, Pledge also announces a new name on the horror scene that commands you to sit up and take notice. Writer/star Zack Weiner has crafted a uniquely sinister look at the human need to be accepted. It’s rush week and David, Ethan and Justin are desperate to join a fraternity. Unfortunately for them, they are considered nerds. David (Weiner) fits the classic mold with his poorly cut curly hair, glasses and “mom picked out my clothing” attire. Although it’s not clear why Ethan is at all considered a nerd and it would appear that Justin’s only downfall would be not having the same BMI as the frat boys, these three are considered weird and turned down at each rush party. Miraculously, one hot girl sees this and she contacts another hot girl who then invites the three nerds to a super exclusive party. It’s all very Hostel and of course they, inevitably, end up at the mysterious and secluded house where only beautiful, rich people are allowed. After spending a great night where they are treated as equals by both the men and the women, the boys are all too eager to return to the house with a bag packed and the willingness to go through a two day hazing ritual. At this point, you may think you know where all of this is going, but you don’t, and that’s the beauty of Pledge. Director Daniel Robins expertly creates a world that seems to be inhabited only by characters from a Bret Easton Ellis novel and it’s equal parts intoxicating and nauseating. Although all of the yuppie assholes are played with just the right amount of smarm, Cameron Cowperthwaite is a standout. The camera loves him, I love him and you will love him. Similarly, all of the nerds are expertly inhabited by the actors. Weiner is exactly the kind of stereotype that we think of when we hear the term nerd, Zachary Byrd plays Justin with a wonderful juxtaposition of cuddly and steely and Philip Andre Botello brings a sympathetic everyman quality to Ethan. Add in some really cool camera work, exceptional effects and extremely cringe worthy hazing rituals and you’ve got yourself a truly fun horror film. 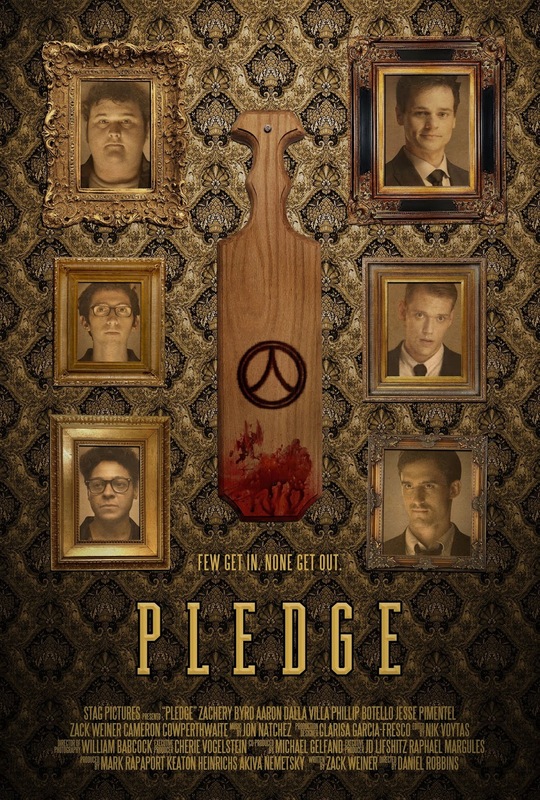 Pledge demands that you go in knowing as little as possible, but even if you do suss out some of the clunky foreshadowing, you will still fully enjoy the ride.